Tanzania is a creation after a union between Tanganyika, and the island of Zanzibar. Zanzibar was a very important off the coast of Africa which was never a colony, as it already had a well-established culture. However, during the 1800's, it slowly fell under British control, eventually becoming a protectorate in 1890. The British then began appointing people to run Zanzibar, and in 1896, the death of the pro-British Sultan Hamad bin Thuwaini led to the accession to power of Sultan Khalid bin Barghash, and this led to the Anglo-Zanzibar War. The Sultan declared war on Britain, only for ships of the Royal Navy in the bay to shell his palaces. A ceasefire was declared 38 minutes later.To this day, the shortest recorded war in history. During this time, the flag of Zanzibar used a yellow field, crossed with red and green stripes, and 2 white. 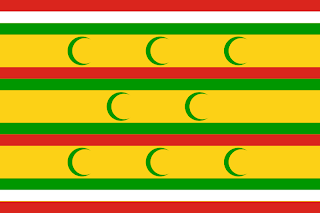 As well as featuring 8 green crescents spread over the flag. Finally, in 1963, the island gained its independence from Britain as a constitutional monarchy. 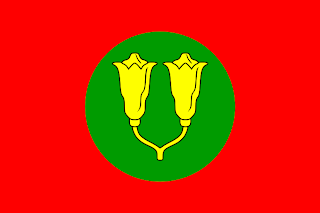 The flag for this constitutional monarchy was a simple red flag, with a green disc in the centre. On the green disc, a yellow flower native to the island. However, this flag did not last long as the island fell into a very violent revolution which saw the genocide of many Asian and Indian people. Eventually, the Republic of Zanzibar and Pemba was born. The flag of the new republic was a horizontal tricolour of blue, black, and green. This flag was used up until the creation of the United Republic of Tanzania. Then, in April the same year, the former colony of Tanganyika took control of the island, forming the United Republic of Tanganyika and Zanzibar, and then later, renaming itself the United Republic of Tanzania. In 2005, the old tricolour of Zanzibar was resurrected, since Zanzibar enjoys a high degree of autonomy. 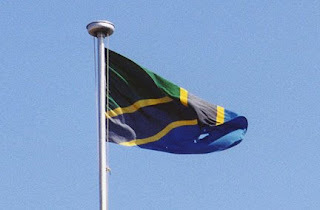 The flag also had the flag of Tanzania added into the top corner on the hoist of the flag, placed in the top blue stripe. Back to Tanganyika. Originally a German colony, the Germans signed a deal with the British. 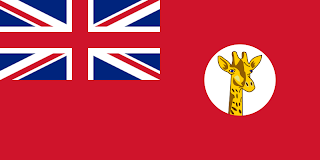 Effectively saying that if the British left Tanganyika alone, the Germans would leave Zanzibar alone. However, during WWI, the British moved in and seized the territory, taking control. This was formalised in 1919 with the League of Nations awarding Britain the trusteeship of the territory. From 1919, to independence, the territory used a British red ensign. It was charged in the fly with a white disc. On the white disc, a Giraffes head. 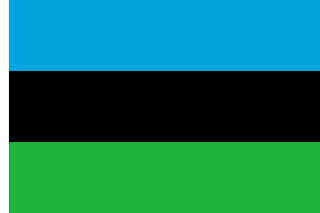 Then, upon independence, the Republic of Tanganyika came into being in 1962, and featured a green flag, with a central black stripe edged in yellow. This flag was scrapped upon unification with the island of Zanzibar. The flag of Tanzania was created in 1964 upon the unification of the island of Zanzibar, and the mainland territory of Tanganyika. It features the colours of both flags. The flag features a black stripe crossing diagonally from the lower hoist to upper fly. The black stripe is edged in yellow. The upper triangle is green, and the lower triangle is blue. 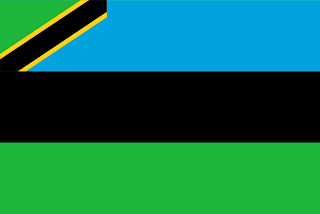 The green colour represents the natural vegetation of the nation, the yellow represents the mineral deposits, the black represents the native peoples, and the blue represents the lakes, rivers, and the Indian ocean, upon which, Zanzibar sits.